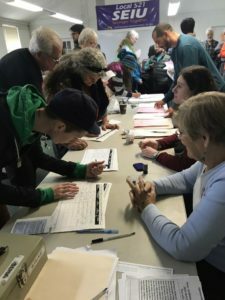 Local Democrats voting in an election to select the area’s delegates to the Democratic State Convention arrived to the event early in the morning, many still yawning and sipping coffee while they mingled outside with friends and candidates. Party organizers held the Assembly District Election Meeting (ADEM) at the Service Employees International Union Local 521 Union Hall to select the area’s Assembly District Delegates (ADD) to represent the district on the Democratic State Central Committee (DSCC) on Jan. 13. The candidates, including UC Santa Cruz student Rojina Bozorgnia, were in the final stages of their campaigns to be the area’s delegates to the DSCC. Delegates vote on bylaws, endorsements and the state party’s overall platform at the convention. People came from as far as Monterey and San Jose to vote in the District 29 meeting. The event is open to the public, although only registered Democrats may vote. Volunteers assist attendees with sign-in prior to the vote. Photos courtesy of UCSC College Democrats. Elected ADD’s make up approximately one-third of all delegates in the state’s Democratic Party. The other two-thirds are comprised of representatives of each region’s central committees and appointments made by elected Democratic public officials. “With the presidential election coming soon, it’s important to have political strength within the party so that you can have a voice at the table.” said Peter Ortiz, a delegate from District 27, which covers the larger San Jose area. Each assembly district can elect 14 delegates to represent them at a state level. In accordance to California Democratic Party policy, seven of those elected must be “self-identified females” and the other seven must be “self-identified men or other”, including those who identify outside of the gender binary. For District 29, which represents Santa Cruz, Monterey and parts of Santa Clara counties, the progressive slate dominated the nominations, with 14 nominees out of a field of 17. According to a preliminary tally, the progressive slate won all of the available seats. No final results were released at time of press. Students played a large role in helping to facilitate the election as well as participate in it. In addition to Bozorgnia running, UCSC student and president of College Democrats Helen Wuellner helped to organize the event. ADEM attendees said the importance of the election should not be understated. Elected delegates have a lot of power within the state’s Democratic party, said Wuellner. “By determining the rules and leadership of the party we can redesign the platform to better stand for our values and the things that we believe in,” Wuellner said. Those who are elected at ADEM are often viewed as one of the closest connections between the Democratic party and the people.